As sous vide cooking has rapidly gained popularity it has been interesting to see the new products that are continually coming to market. We try our best here at Amazing Food Made Easy to keep our readers up-to-date with reviews on these new products. This review is on a relatively low-tech sous vide accessory - SO-VIDA Sous Vide Weights. We thank Will, over at SO-VIDA.com for sending us a package of three of these weights for us to experiment with. If you have done much sous viding then you have probably been faced with the floating bag challenge. This occurs typically with buoyant vegetables, frozen proteins, and when there is too much air in the bag. Any of these can cause the bag to float to the surface, exposing a portion of its contents to the air. This can cause an unsafe situation since the food is not at the proper temperature. There are a number of ways to Prevent Sous Vide Bags From Floating. In this article I will focus on the use of weights, inserted inside the bag, to hold them down below the water level. As you can see from the photograph above, courtesy of SO-VIDA, the sous vide weights are comprised of a 5 oz. 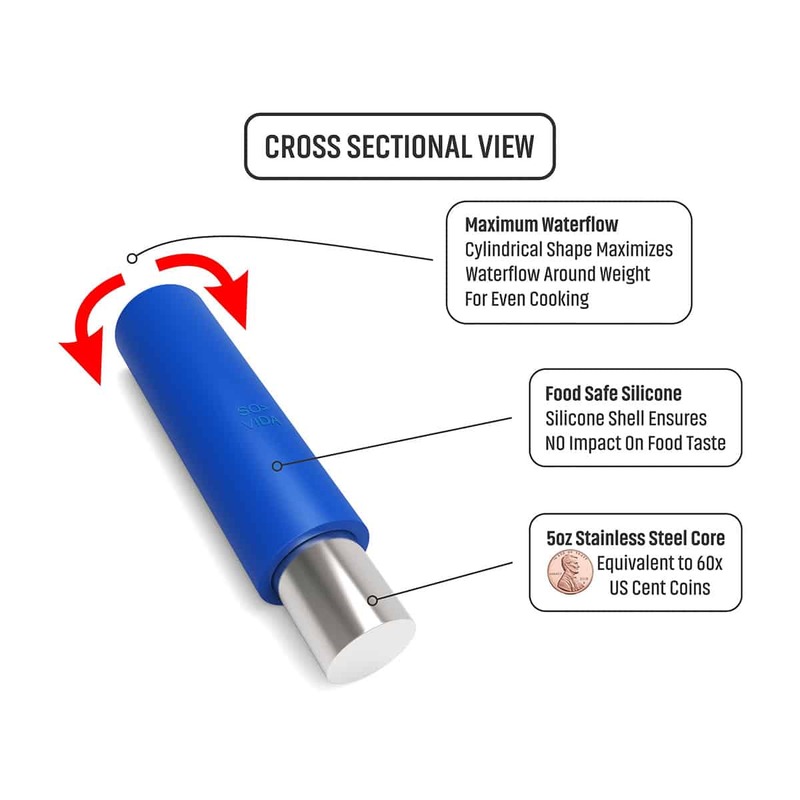 (142 gram) stainless steel cylinder encapsulated in a shell of food safe silicone. The sous vide weight is placed inside the bag along with the food that's to be cooked. The silicone shell prevents any type of impact on the taste of the food in the bag. It also makes it easy to clean the weights after cooking, whether in the sink or in the dishwasher. The weights are also relatively small, so they don't cover much of the food ensuring good water flow around the weight for even cooking.With my somewhat limited experience using the weights, one weight per bag was adequate to keep it from floating. There are certainly situations where you might need to add a second weight to overcome extreme buoyancy. The primary use for the sous vide weights in sous vide cooking is to meet the floating bag challenge mentioned earier. As you can see from the video above, vegetables such as asparagus and Brussels sprouts are quite buoyant and will float. Also, many proteins, which are coming directly from the freezer, will also float to the surface. Using sous vide weights could not be any simpler. You just slip one of the weights in the sous vide bag before you seal it. If you plan to freeze the item you still need to put the weight in the bag before sealing it, and then freeze the combination. That way all you need to do is take it out of the freezer and plunk it into the water bath. I did discover that you do need to be aware of where you place the weight in the bag. For example, when first prepairing the asparagus for sous viding, I placed the weight at the bottom of the bag and then added the asparagus spears above it. I quickly discovered this was a mistake! What happened was that the weight sunk to the bottom of the water bath, but then the asparagus spears "stood up" perfectly vertical, placing the tips above the water level. To correct for this issue, I made a new sous vide bag, this time with the weight centered and lined up with the spears. When I placed this in the bath it dropped to the bottom of the water bath as I had hoped. You can see how effective the weights were with the asparagus and frozen chicken in the video below. As I mentioned earlier, my experience with the sous vide weights is relatively minimal. However, if you look on Amazon at the reviews, you can see that the vast majority of sous viders who have purchased the weights, think they're the greatest. You know when a product has 4.8 stars, it is solving the problem it was designed for! BTW, they are also "Amazon's Choice" for "sous vide accessories". SO-VIDA Sous Vide weights take very little room in your sous vide container, unlike some ad hoc type solutions. It is quite easy to fit in numerous bags in the container. You do need to be careful that you don't "stack" them on top of one another, thus limiting the flow of water around the bag. These will work well for most families. Also, when you are storing the weights, they take a lot less room in your kitchen drawers than something like a rack, for example. Since the SO-VIDA Sous Vide Weights are such a simple solution to the floating bag challenge, they can be used in numerous ways as necessary. As mentioned earlier, the placement of the weight in the bag may impact its effectiveness, but it's easy to learn what placements work the best. And of course, you always have the option to add additional weights to the bag if necessary. Since I used a vacuum sealer when testing the sous vide weights, they stayed positioned exactly where I placed them. However, if you are using them in something like reusable silicone bags or Ziploc bags, the weight could drop to the bottom of the bag, which could cause a portion of the bag to float above the water level. This would be similar to the poor weight placement issue I mentioned with the asparagus, earlier in the review. If you want to freeze numerous bags of proteins such as chicken breasts, you would need to place a sous vide weight in each bag prior to freezing. This could get to be relatively expensive if you're freezing a lot of proteins. Perhaps there is a workaround for this? Of the numerous methods I have used in order to defeat the sous vide floating bag challenge, the use of the sous vide weights is by far the quickest and easiest solution. You simply need to vacuum seal the weight in with what you are cooking, and then just drop it into the water bath and watch it sink to the bottom. Initially, I was not wild about having something in with my food, but I am now pretty much convinced that the silicone coating on the weight prevents any type of impact on the taste of the food. 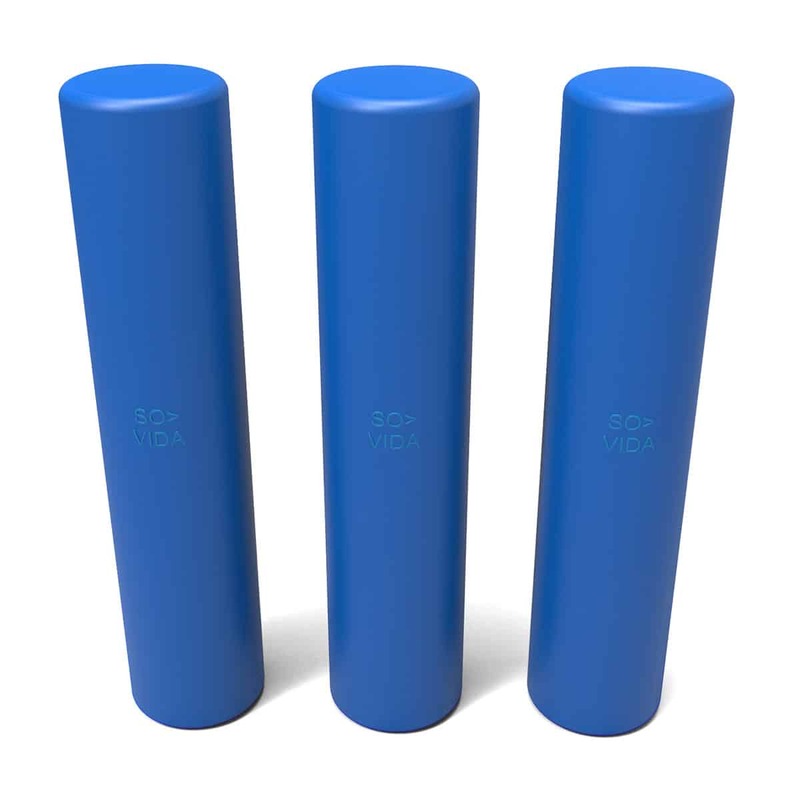 I would definitely recommend that you might want to include a set of three of these sous vide weights in your sous vide "toolbox" as one viable solution to the floating bag challenge. If these SO-VIDA Sous Vide Weights sound like something you would like, you can get them on Amazon. If you have experience with the SO-VIDA Sous Vide Weights, I would appreciate you sharing it in the comments below. Thanks.